Posted on April 15, 2019, in WWII and tagged 1940's, family history, History, Military, Military History, Type 4 Ceramic Grenade, war, WW2, WWII. Bookmark the permalink. 112 Comments. Grenades are a fascinating weapon, like a mini-bomb. 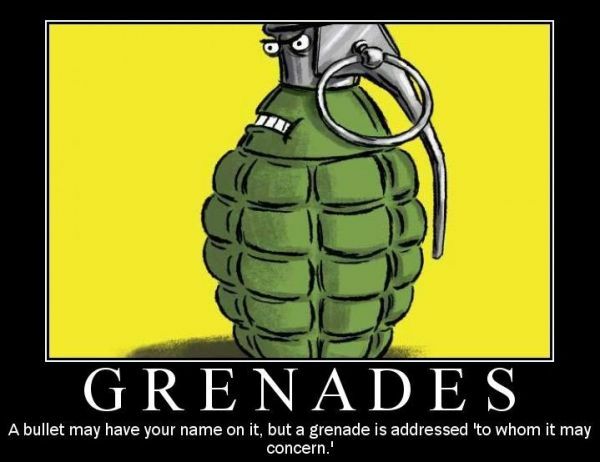 I should write a story that needs a grenade in the plot. I love the cartoons at the end! The Germans made ceramic grenades back in the 17th century, what goes around comes around. Necessity, I suppose, Beari. I wouldn’t want to carry around 1 pound grenades along with all the other gear either! I know of some horrible results with grenade implementation. Sad. Thank you, Jennie. They did believe in making do with what they had. You are welcome, GP. Makes perfect sense, too. It is an unusual one, that’s for certain. How right you are. I keep wondering where that pile of broken ones are (if they still exist). Sounds like they would sell like hotcakes in an antique store. GP: I’m always bemused by depictions of grenades in war movies. You’d think those guys were throwing A Bombs with the huge explosions, smoke and fire. I chucked a couple of pineapples at Camp Wainwright. They just make a popping sound and the frags fly. Those frags can fly a long way though. I knew nothing about those Japanese grenades. Interesting. Hollywood, if anything, has a habit of turning reality into fiction, and I think the actors are lost in those fairy tales. I’m really surprised that no one mentioned the ceramic insulators that were found on power poles all across this country for years. Even today, you can find those glass and ceramic insulators in antique shops, and there are active collector groups. No one mentioned the smudge pots that were used in orchards or along highways, either. I remember seeing them as a kid. The aerospace industry still is using porcelain insulators in some applications. I wonder if all of that resulted from the initial Japanese applications? I really don’t know, but now that you’ve mentioned it, the subject would be interesting to look into. You do tend to think of things others miss (including me!! 🙂 ), Linda. Thank you for being you!! Ceramic grenades? Who’d have thunk it? There’s an elegance to the notion. Ingenious, indeed. I’m wondering if perhaps they would feel safer just having it as a backup. But they would have been rather heavy to carry around with you. Practical me! One more thing to not weigh down a soldier would be appreciated. Much appreciated, John. It seems to be a little known topic. haha, glad you got a chuckle out of them. I thought they fit the post rather well. I still think it would be a good idea for the arms industry (and the warmongers) to have to field test their products (in active-service) themselves. As users, not as coddled observers. That sounds like my complaint that the politicians should fight with whom ever they have a beef with! The wars wouldn’t last 18 years – that’s for sure! We all know little pieces of that war – now to try and get them together, eh? This is new to me as I have never heard of a Ceramic Grenade before today! You know so much about the military. No I am not. This is my only mode of social interaction on the web. I started this blog to save what was in my grandmother’s scrapbook for my father as it was deteriorating with age and weather. It took off with a life of its own and I love how people contribute additional information as we go along. 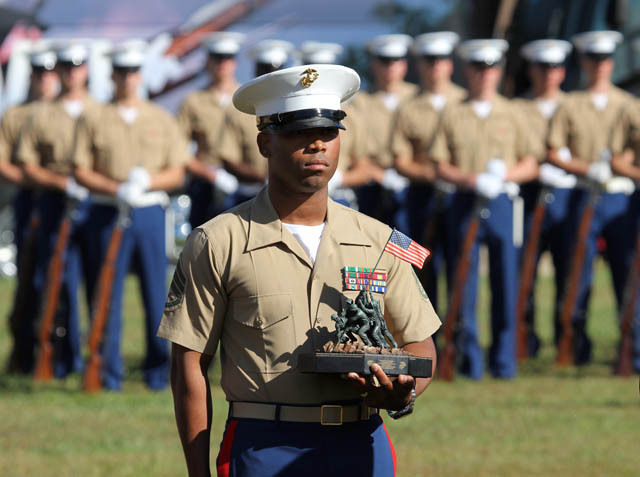 It helps to make it more of a communal effort to honor those troops. I am so glad for your site! This is fascinating, GP; I could’ve never imagined that grenades, or any other weapons for that matter, would be made of such fragile materials. Making-do I believe is the motto. Nowadays we have ceramic stove tops and kitchen knives. I love my ceramic knives, but they don’t explode when shaken. As to making-do, stay tuned! Sounds like something very interesting is going to evolve!! Absolutely fascinating ! I’ve had trouble enough lighting road flares , and they didn’t explode after five seconds were I to delay or mishandle them. Very inventive! Years ago I read that the Japanese had invented a rust free ceramic car which was strong enough to crash without being significantly damaged. I would think that the pans for it are at the bottom of a deep, deep well at Toyota’s Fukushima factory. Oh, I’m sure you are quite right, John!! Like every ingenious invention that would save the consumer money – hidden in someone’s vault. Excellent article, GP. Brand new information to me. Thank you for taking the time to read it, John. Your stuff is always a not to miss reading thing. WOW, that is a compliment!! Thanks, John! 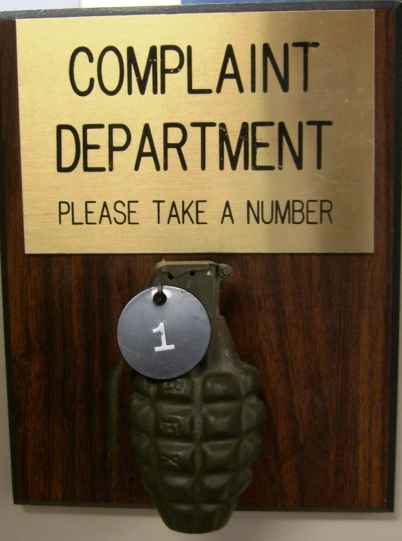 A ceramic grenade doesn’t seem like an inspired choice but I guess you work with what you have. Good humor today, GP! I’m sure it wasn’t as effective, but “making-do” seemed to be the motto of that era – then again, what choice did they have? Happy you got a kick out of the humor! Yet another bit of info I wasn’t aware of. Ingenious of the Japanese to overcome the lack of metal and still build an effective weapon. I wonder about the failure rate. About halfway during my tour in Vietnam, they introduced us to the “baseball” grenade. We had been using the “egg” shaped ones (can’t remember the technical name). These were smooth bodied, not the “pineapple” surface. At first I was glad for the new round shape. However, there were a few produced that were “short fused.” This resulted in one Marine in my platoon who had a baseball grenade explode in his hand, blowing off his hand and most of his head when it exploded. After that, we scrambled to collect the egg shaped grenades. Sort of like the original M-16s they issued us. They jammed if you looked at them crooked. Newer models later on took care of the problems with the grenades and rifles, but those of us using the early ones considered them untrustworthy. Not a good thing for combat troops to have. I remember those M-16s. They seemed to be more reliable if you didn’t quite load them to the max. But I hadn’t heard about the grenades – awful situation! Yeah, we would rarely put more than 18 rounds in a magazine. Those open, 3-prong muzzle flash suppressors were like magnets to vines and other vegetation. We cleaned them as often as possible, but the slightest bid of sand or dirt and you had yourself a single-shot weapon, IF you could clear the jam in time. A few guys still carried the M-14s (a great weapon, IMO). They had to beg rounds from the M-60 teams. Oh how those M-14 guys were envied! I’m not well versed on the M-16; however, the fault can be laid on the damn “chiefs”. They substituted the ammo intended for use which used a clean burning powder with far less residue. I did a quick search and thanks to the commenters got the “skinny” on the weapon’s jamming. The Original models of the M16 were trouble free. They fired a special round with a low residue charge so the mechanisms would not become fowled. But, when the Army bought large quantities of the weapons the ammunition that was supplied was filled with the same gunpowder that had been used for the M14. It gave the M16 more punch, but was dirty and fowled the weapon, which caused it to jam. Because the original weapons had been so trouble free the new mass-produced weapons that followed them were suppose to be maintenance free, so cleaning kits were not supplied with the rifle. Once cleaning kits were issued the problems cleared up, and the M16 proved to be a much better weapon in the hands of soldiers who were trained to keep their weapons clean. The jamming problem was something that happened early on when Robert McNamara ordered new M-16 not built to the specification of the original weapons. The cost cutting corners left the weapon prone to jamming unless it was cleaned on a regular basis. Crumbs! Now there is a cottage industry to revive for discontented voters! Sorry to say that my mother, ex ATS, died on March 24th….I will miss passing on your posts to her. I am so sorry to hear that, Helen. Please accept my condolences. The world lost one of the good ones!! Another potentially deadly weapon that fortunately did not come into service. Great informative post, GP! 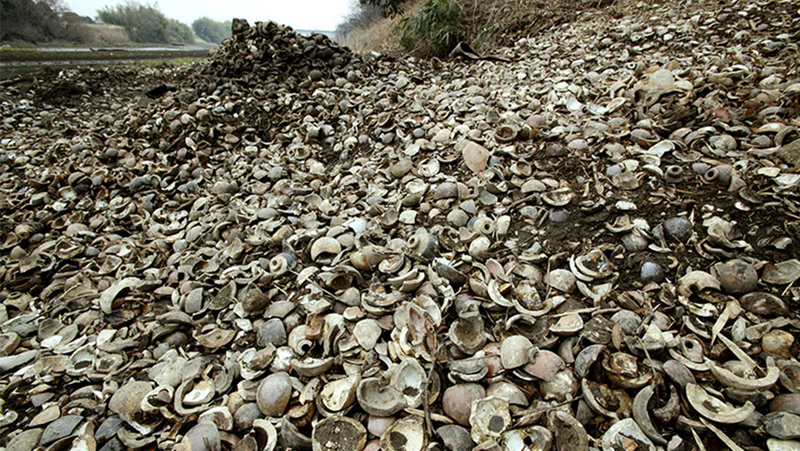 What do you think we could make out of all that broken pottery? Great post, I did not know about these. Once you pull the pin Mr. Grenade is no longer your friend. Yup – it’s time to say goodbye to that friendship!! I imagine so. Creativity at work! Yup, and no need for a Number 2, that’s for sure! The ingenuity of munitions people is pretty remarkable. They do find ingenious ways to wage war. Interesting. Its great to discover these bits of information from you. Thank you. I just happy you find them of interest. A new knowledge again for me. Looking at that ceramic granite pile, they could recycle them into something beautiful for the home after the war. I’m certain they could have been. We can only guess what ever happened to them. At least, I have no idea. I wonder how many of us were harmed/injured by this weapon. This new info is greatly appreciated. I glad you found it interesting, Michael. Your posts contain such interesting, little know facts. Thanks. I never knew about these. Great job, GP on explaining the reasons/process and results. It’s scary, how little it takes to make weapons like this. Thank you. Yes, it is too easy, as is shown in the news all too often. Great of you to stop by today, Dan. Very true. A member of the 11th A/B was killed in New Guinea while he attempted to demonstrate a Japanese grenade to the troops. 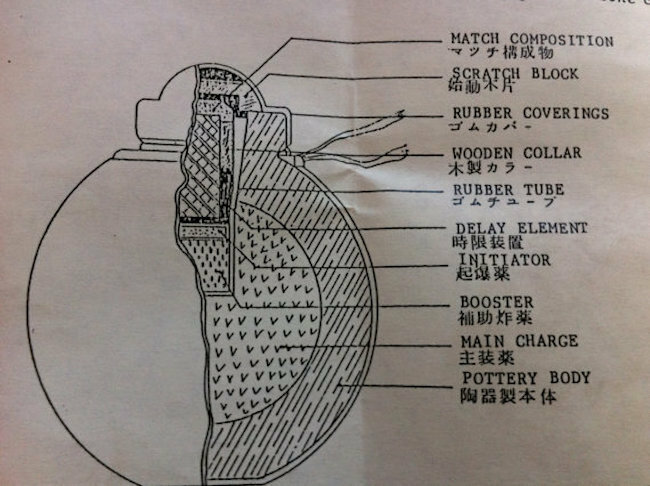 Fascinating, informative post on something I never heard of, ceramic grenades. Glad to hear I hit on something new for you!! haha, no need for a number 2, eh?!! Thought you might like this one! Thanks for stopping by. Thank you very much for your interest in this article, David.